so i was in the 'burbs today, nice and quiet day because school starts in a week and everyone's away before crunch time. i actually prefer quieter days even though i get paid on comission/production because i can take my time, chat with the patients, and really do a good job even if it means seeing fewer people (less stress). it's just not my style to be an animal at the office and "make a killing, go go go $$$" - even my quietest days are quite productive and i'm satisfied just if i get out on time and i'm nice and relaxed all day. so that what was pretty cool about today, plus insane boss lady was away! i thought i was going to have tomorrow off because the schedule was dead and the few patients i had they diverted to the other associate (which was FINE with me!) but the hygienist called in sick lsat minute and just called me to cover for a few hours :-( i'm not above doing hygiene, but i really wanted the day off. shouldn't be too bad, though, only for a few hours and i have the morning off with cookie. did i also mention that insane boss lady won't be there tomorrow??? a day off, a day off, a day off! i cherish these moments, so few and far between. and i mean a real day off, sunday doesn't count because of all the crap i have to do around the house. canuck had crazy hours today, 9 - 8 at his new office up north, so cookie and i had the whole day to chill out. i made the beds, dusted, did the dishes, tidied up a bit, and plunked down and watched the news for a few hours (CNN because it reminds me of home). then cookie and i painted my toenails this really wicked color from revlon, silver something-or-other, but it really is like a metallic purple. she watched me do my nails and begged me to paint hers "princess purple" just like mommy. of course, i had to oblige. and she actually managed to stay still long enough for it to dry, miracle of all miracles! then we made grilled cheese sandwiches, which i cut into the shape of a heart, and settled down for a nap after lunch (mommy too!). later in the afternoon, we walked to payless where we bought cookie some new shoes for the fall - both pairs PINK, of course. then i picked up some pretty hand towels for the downstairs bathroom at linens 'n things, browsed for fall clothes, and stopped for gelato as a real treat, yum (cookie had chocolate and i had hazelnut, my favorite). we had time to play at the park for a while before it started raining and made it back in time to make dinner. now we're watching the little mermaid (for the hundredth time) and waiting for daddy to get home. tomorrow, back to work *sigh* but at least it's a short week and a long weekend for both me and canuck. so i'm really excited about work next week - my schedule's packed at the downtown office, the long weekend's coming up so i'll have a saturday off for the first time in forever, and crazy-boss-lady's on vacation, yippee! i'm looking foward to a productive yet uneventful next couple of days. tomorrow i go into the city again, and it'll be good but i do have a case that i'm kinda dreading a bit. one of my patients is a very, very nice girl, but extremely phobic of the dentist. she's from bulgaria, where she said when you have a toothache you basically have to decide which is worse: staying at home with the pain or going to the dentist where you knew the pain would kill, maybe even worse than leaving it alone. my predecessor completed RCT on #27 and she had a very difficult time freezing, which is suprising for a site that you can pretty much 100% successfully infiltrate (septanest usually does the trick for me). i vowed to send all RCT that she will (hopefully not) need to a specialist because of this - just something my gut tells me. anyways, she has a ton of interproximal caries and her schedule is limited to saturdays (of which i'm there only twice a month), so we've been working by quadrant very, very, very slowly. uppers, not a problem. but the lowers, what a disaster! very difficult to give an IA block and when i do, she just eats through it like crazy. and on saturdays, i get tons of interruptions from all the emergencies and hygiene checks that i got to do, so i have a very limited window of time that i can work with her. she's so sweet, very understanding and extremely apologetic, and i'm like, no, it's my fault, i failed to numb you up, and she's like, no, it's my fault, i'm a freak of nature! and we go on and on for hours. after two appointments of extremely short duration and/or complete failure to obtain profound anesthesia, i gave her a script for 5 mg valium a half hour before her appointments. i heard that often does the trick in a pinch. i also have an intra-osseous anesthesia (stabident) system, but i'm not all that comfortable using it yet and i don't want to experiment on this person. right now she's in temporaries on her lower right and still has 2 cavities on her lower left. so if the drugs don't work, i don't know what on earth will. needless to say, i'm keeping my fingers crossed. minimally invasive dentistry... where do i draw the line? when a patient comes in and asks me "how long" something will last, i usually give them ballpark averages from what i've heard and read (ie. fillings about 5-7 years, crown and bridge about 7-10 years, etc) but i always give them the caveat that no matter how well any work is done, all of the materials we work with have a limited life span and that things may eventually wind up being replaced or repaired. in fact, about 95% of what i do is replacing and/or repairing old and failing work. the fact is once you open up a tooth, you are officially married to it (so at this point i can safely say that i have about 1000 husbands!) and it becomes your responsibility. the mouth is a very harsh place, and even the tightest margins can leak, the strongest porcelains may fracture, the most disinfected canals become re-contaminated. but it never ceases to amaze me - how some of the most pristine, carefully executed work can fail, and yet some of the crap that passes for clincially acceptable by some standards has managed to last all these years. go figure. take today, for example. about 2 months ago i did some restos on a guy, about college age. he had kissing cavities on #37 M and #36 D, just at the DEJ. could they have remineralized with some fluoride and floss? possibly, some may argue. but the guy's oral hygiene was absolutely abysmal and they looked quite broad inciso-gingivally on the radiographs, that something told me to go ahead and do them. i pulled out all the stops - rubber dam isolation (because yes, i do use them, especially when placing posterior resins), very conservative slot preparations, two step clearfil prime and bond system, beautiful margins, perfect occlusion, all good to go, right? nope, guy's been sensitive to biting ever since i touched the damned teeth so there was nothing left to do except remove the fillings today and place IRM. it broke my heart to remove all of my hard work, and it was so well-done (and i don't often pat myself on the back, either) but he was just not comfortable and when that happens, the treatment has failed. i worked on those teeth, they are now my babies. but what was i to do at that time? leave the asymptomatic caries there and allow them to potentially get worse? or "fix" the teeth but potentially cause him discomfort and/or inconvenience? and then here's the real kicker - new patient walks in just a few hours later, HUGE amalgam overhang on #25 D, as if the dentist didn't even use a matrix band, and it has an associated localized perio defect. the tooth is completely asymptomatic, just "bleeds a little when i floss". not even noticed by the patient until i point it out. how the hell does this happen??? how does such negligence go undetected? and why is my hard work "cursed" with problems while this guy can get away with something like that? why, why, WHY??? it feels like no matter how hard one may try, dentistry is just not an exact science. i guess that's what can be so frustrating sometimes. you try to do good work , and in the end it just so happens that you can make seemingly okay situation worse. so when patients ask me to guarantee my work, i simply say, "the only tooth i can guarantee is the one a dentist has NOT worked on, so you better take care of the ones you got." and that is why i definitely espouse the philosphy of minimally invasive dentistry. my question is, though, when do you cross the line from a conservative approach to supervised neglect? how can you distinguish the two? what do you treat, and what can you leave alone? what is more harmful? how many patients have i recommended/referred for implants who were turned off by the cost and/or time involved? so many people walking around with edentulous spaces, and i'm just itching to restore but i have met so much resistance. but times have slowly been changing, as three of the referrals i have sent have not only followed through and have agreed to financial arrangements with the surgeon, but one patient actually underwent the surgery on july 18 at sites 14/15, 25, and 47 and will be ready to restore in 3 months following confirmation of integration! i haven't restored implants since i was a resident about three years ago, and i've been waiting to use my knowlege for some time but haven't found the right practice/patients to do so. needless to say, i'm super duper excited! a day that i wished i had my camera! it just so happened that by coincidence canuck and i had the day off together, which happens about once in a blue moon. today was a holiday that is new to me, Civic Day, and he managed to get the day off from his office. i myself was actually asked to work today, but turned it down because i mistakingly thought cancuk was working and the in-laws were in montreal, hence no one to watch cookie. in fact, i kept asking him, so what time do you have to be in tomorrow again? and he's like, why are you asking me that? i keep telling you i have the day off! oops. it was like i couldn't believe it, it was just too good to be a reality! so we headed downtown and over to centre island, where the three of us had a nice picnic lunch, strolled around the park, and saw the mini-farm/petting zoo. cookie made it through the whole day without having an accident! i could have gotten some great pictures, but our camera is somewhere in transit, all freshly repaired and delivered from HP (see the may post about the day cookie and the digital camera went swimming in lake ontario). it was a lovely day - sunny, not too hot, and i managed to not get burned. i wish i could have taken some pictures! back to work at the office downtown tomorrow, where i'm delivering a full gold crown on #27. man, that thing was a beast to prep - so far back there, strong cheeks and lips, a large old failing amalgam (i cleaned out the defective parts, placed vitribond, and used the rest as a core, forget trying to remove the whole thing, isolate and bond core paste in that a tight space) i'll also be delivering a white gold inlay on #47 on the same patient next week. i love doing full gold restorations, inlays, onlays, you name it. when done properly, they last, and last, and last. i myself have three full gold crowns on my lower molars, and i love them. easy to keep clean, no irritation to the gingiva, and i don't have to worry about any porcelain flaking or snapping off. i'm also all set to attend the dentsply advanced endodontic training course on september 15, where i'll learn some tips on access, rotary instrumentation, and obturation. i'm very excited, because i love doing root canals and want to get truly proficient, expecially because i feel my obturation results have not been as consistant as i want them to be. hurray for CE! my kid's the cutest. for real. 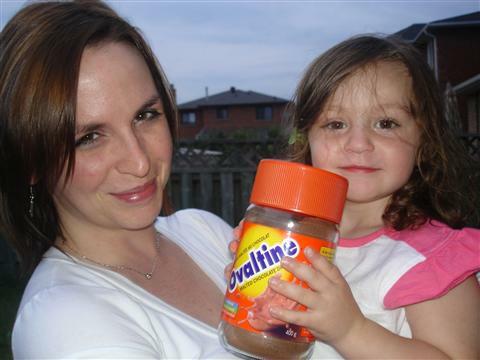 and yes, minutes later, she dropped the ovaltine jar and it shattered all over our backyard. my daughter is half potty trained, what a big girl! meaning that she wears big-girl undies and always asks to make pee-pee on the potty. she hasn't wet herself in about a week and has almost completely abandoned diapers! she even sleeps in her undies, princess ones that i bought from the disney store that she picked out herself! so, we're making great progess on the road to being a big girl. only one small catch. while she's adept at holding the pee in for long periods of time, something i thought would be even more of a challenge, she absolutely refuses to poop in the toilet! even when we take her every 2o minutes around the time she goes (she's very regular and predictable) she'll still manage to have an accident, or not so much an accident as sheer defiance in this case. i guess she'll just have to keep pooping in her pants until she tires of it, since i don't want to regress to diapers (i think that will be giving her a mixed message, you know?) any suggestions??? so i've been at the office in the 'burbs now officially for two months. i make damn good money and the staff is phenomenal and the patients are terriffic, but the place is not without it's kinks. no place is perfect, of course not. but did some things ever just rub you the wrong way, even if when you break it down mentally and there's no rational or logistical reason for it, you kind of just get a hunch or an unsettled type of feeling? that's kind of how i feel about my (newest) boss. i've only been out about three years, so i know i'm still the low man on the totem pole. at the same time though, it's like, dang i've been out for three years now, am i ever going to stop being the low man? i've worked for people before, people who have invested a lot of time and money into their offices, and of course when i have an office of my own i'll be a bit of a megalomaniac myself. it's only natural to want to protect your business. and i completely understand where this person is coming from. but why is her particular approach and her constant reminding me of my place just not sitting well with me? am i being hypersensitive and should i just accept this as the way things are until i've "proven myself" and/or it's my turn to be in control? or do have enough experience under my belt at this point to warrant a little more trust and respect, and is this really not the right kind of environment for me? and the icing on the cake of the day: geting scratched on my hand by a composite finishing but that had just been used subgingivally on a Hep C positive patient. gotta love the health professions!